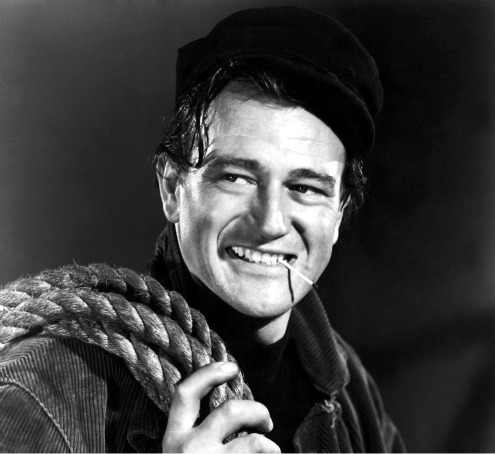 This is my third year participating in the TCM Summer Under the Stars blogathon hosted by Kristen at Journeys in Classic Film , and second entry spotlighting Big John Wayne . The Duke and director John Ford made eleven films together, from 1939’s STAGECOACH to 1963’s DONOVAN’S REEF. 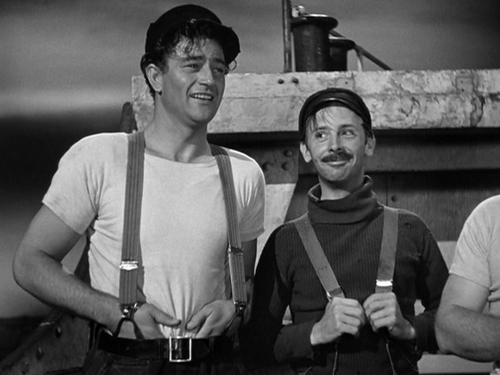 Wayne’s role in the first as The Ringo Kid established him as a star presence to be reckoned with, and the iconic actor always gave credit to his mentor Ford for his screen success. 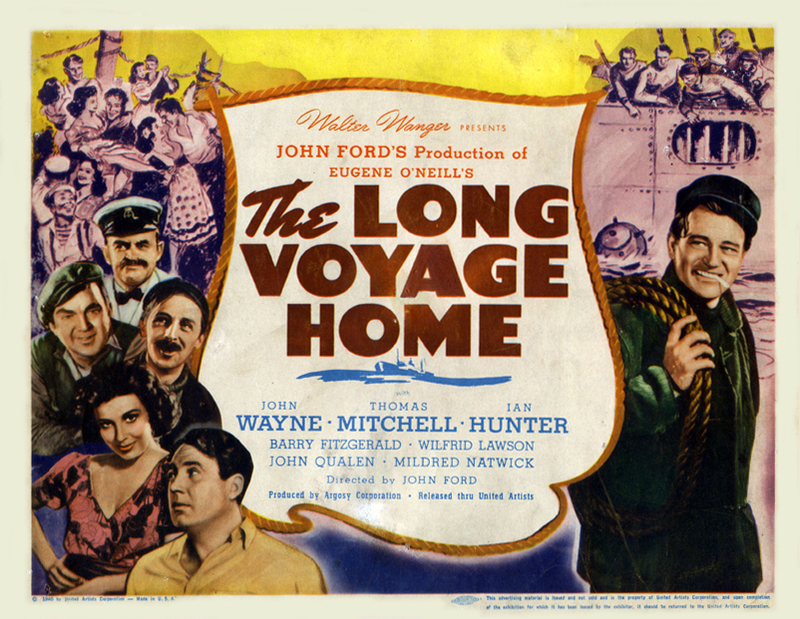 I recently viewed their second collaboration, 1940’s THE LONG VOYAGE HOME, a complete departure for Wayne as a Swedish sailor on a tramp steamer, based on four short plays by Eugene O’Neill, and was amazed at both the actor’s performance and the technical brilliance of Ford and his cinematographer Gregg Toland , the man behind the camera for Welles’ CITIZEN KANE. THE LONG VOYAGE HOME is a seafaring saga detailing the lives of merchant marines aboard the ship Glencairn on the cusp of World War II. The film is episodic in nature, as screenwriter Dudley Nichols wove the four one-act plays into a cohesive narrative. Duke is ‘Ole’ Olsen (no relation to the great vaudevillian), a sweet-natured young buck longing to return to his homeland and his elderly mother. Ole is a gentle giant of a man, whom the hardened sailors look out for, treating him as a kid brother. The naïve Ole has been out at sea ten years, trapped as the others are in a cycle of time on the ocean followed by spending all their dough on liquor and women when they hit port, forcing them to return to their cruel master the sea. This time around, they’re determined to make sure Ole gets back to his farm in Sweden, to break free of the lifestyle they are all caught in by fate and misfortune. Wayne’s much-maligned Swedish accent isn’t all that bad, as some critics have harped on. Duke was nervous about doing the part justice, and had Danish actress Osa Massen (A WOMAN’S FACE, YOU’LL NEVER GET RICH) coach him with the rhythm and cadence of the language. His big scene at the bar, where he’s being set up to be shanghaied by the ship Amindra’s salty crew, shows Wayne’s accent was more than passable, and once again proves to the audience he could do more than just sit tall in the saddle and throw a mean punch at the bad guys. John Wayne, when the occasion called for it, could act. Due to the structure of the screenplay however, Wayne doesn’t have to carry the film on his broad shoulders. Though ‘Ole’ is the glue that holds the film together, the rest of the ensemble all take their turns in the spotlight. The standout here is Thomas Mitchell , winner of the previous year’s Best Supporting Actor Oscar for STAGECOACH, as the boisterous veteran seaman Driscoll, a two-fisted Irishman whose sad fate at film’s end will haunt you. Ian Hunter, an underappreciated actor, plays the role of Smitty, whom the others suspect of being a Nazi spy, but instead harbors another dark secret. Ward Bond , the rowdy Yank, is given a solemn death bed scene, and gets a chance to show off his own acting chops. 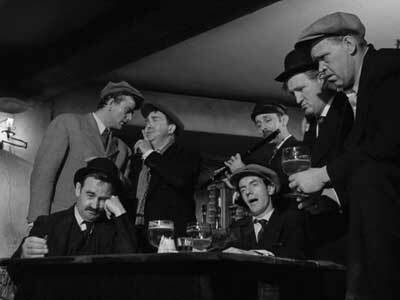 Barry Fitzgerald seems to be preparing for his role as Micheleen in THE QUIET MAN as Cocky. Fitzgerald’s brother Arthur Shields is the philosophical Donkeyman, who never leaves the ship for fear of triggering his alcoholism. Mildred Natwick makes her film debut as the prostitute Freda, charged with the task of seducing Ole before he’s shanghaied. John Qualen does his own inimitable Swedish part as Axel, mentor and protector to Ole. Familiar Faces Billy Bevan, Danny Borzage, James Flavin, J.M. Kerrigan, Wifred Lawson, Cyril McLaglen (brother of Victor), Jack Pennick, and Joe Sawyer round out the rugged cast; most were members in good standing of Ford’s stock company. 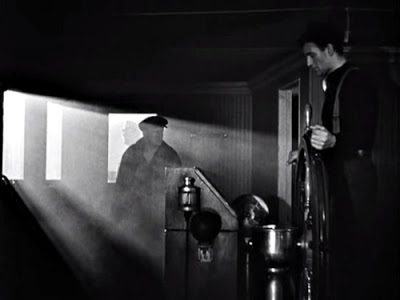 The real star of THE LONG VOYAGE HOME is Gregg Toland, who Ford had compete trust in to create the film’s visual mood. 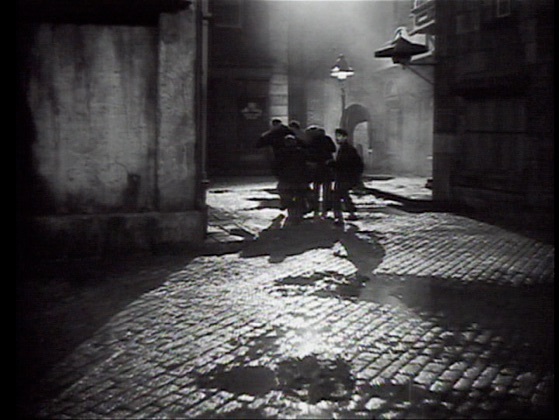 Toland’s experimental deep-focus style, utilizing back projection, makes the film an illusion of reality, his heavy shadows and dramatic lighting schemes a definite precursor to what would become the film noir style. John Ford was no stranger to making art films, and together with Toland certainly achieves success. Orson Welles once said he watched STAGECOACH over 40 times before filming CITIZEN KANE; there’s no doubt in my mind he did the same with THE LONG VOYAGE HOME. While it’s not the type of film one would normally associate with the John Wayne/John Ford canon, THE LONG VOYAGE HOME should be watched by fans of both men’s work. The somber mood is laced with black humor, the cast is superb, Toland’s influential camerawork is a marvel to behold, and it’s a chance to see a different side of John Wayne. Sandwiched between STAGECOACH and THE GRAPES OF WRATH, THE LONG VOYAGE HOME doesn’t get the attention the other two attract, but deserves a place in the pantheon of John Ford’s masterful film classics. I have seen a lot of John Wayne’s but never this one. Will have to check it out! It’s certainly different from most Wayne/Ford movies, but definitely worth your time, Christine! Ooh. Thanks for introducing me to this movie. John Wayne is my childhood hero but I really only know him as a cowboy. Will track this one done. Looks good. That fantastic cast alone makes this one worth tracking down! Never heard of this one before! Thanks for the introduction, I will keep an eye out for it. John Wayne is a legend of film. He is my dads favourite Western actor, and I grew up with his films regularly playing in our house. “The Long Voyage Home” doesn’t get much attention, but I thought it was a great film. 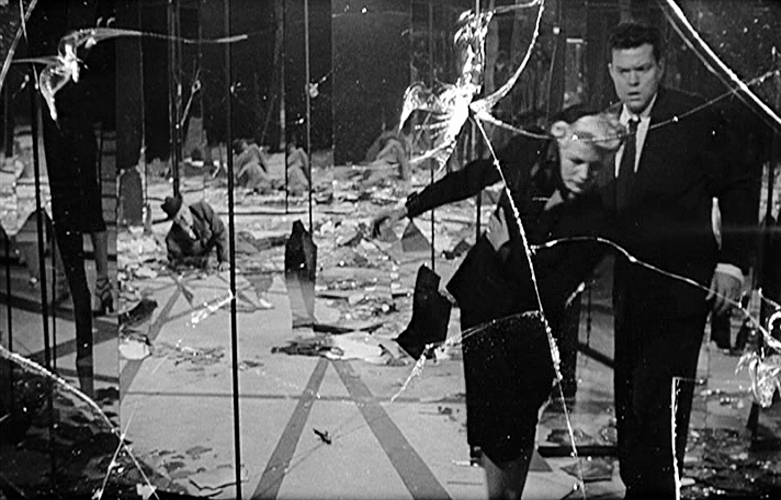 Gregg Toland’s innovative cinematography adds so much to the film’s mood. I hope you get the chance to watch it!